"Don't take the word deviled lightly! 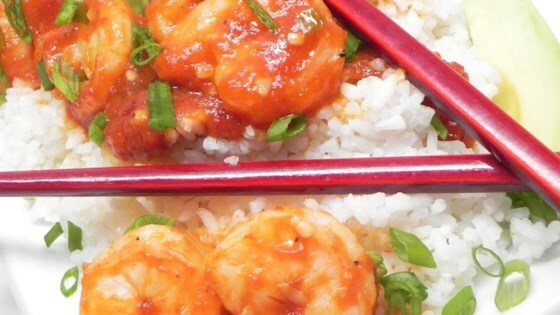 These prawns are cooked in a super spicy sauce made with ketchup and chipotle chiles in adobo. Serve with white rice and avocado slices." Whisk 1/4 cup butter, lime juice, olive oil, spring onion, garlic, salt, and pepper in a bowl. Add prawns and toss to coat well with marinade. Melt remaining 1/4 cup butter in a saucepan over medium heat. Add prawns with marinade; cook until pink, 3 to 5 minutes. Combine ketchup, chipotle peppers, liquid seasoning, and salt in a blender; blend until smooth. Pour ketchup mixture over prawns and cook, stirring constantly, until sauce comes to a boil. Reduce heat to low and simmer until sauce thickens, 3 to 5 minutes.